Hieroglyphic StairwayThe Hieroglyphic Stairway rises 21 metres up the western face of Structure 10L-26 (Temple 26) and features 62 steps formed from over 1250 blocks of stone, each expertly carved with hieroglyphs, which total over 2200 – making it the longest Mayan text ever discovered. Today, it stands as it was after the final phase of construction, which was completed by Ruler 15, K’ak’ Yipyaj Chan K’awiil – known as “Smoke Shell” – who is portrayed on Stela M at the foot of the steps. 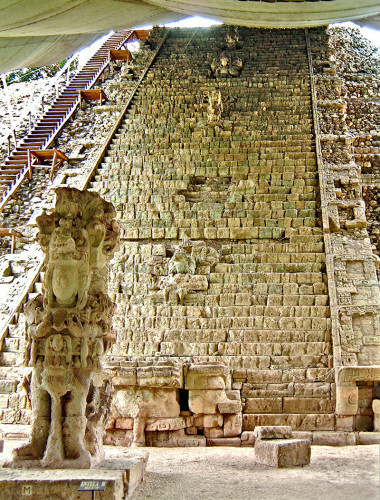 However, the archaeologists who reconstructed the stairway in the early 20th century had no knowledge of how to read Mayan glyphs and were only concerned with recreating Temple 26 as best they could. This meant that apart from steps 1 to 15, which were still mounted, the rest of the blocks were put in a random order, rendering the text almost completely unreadable. Since significant advances in decoding the Mayan writing in the 1980’s, researches have been desperately trying to piece the puzzle back together to understand exactly what the text says. Today, enough information has been learned through deciphering the texts and excavating deep within the structure to have almost a complete picture of what the stairway was designed to tell us. The Hieroglyphic Stairway was first begun by Copan’s 13th Ruler, Uaxaclajuun Ub’aah K’awiil, who is known more simply as “18 Rabbit”. 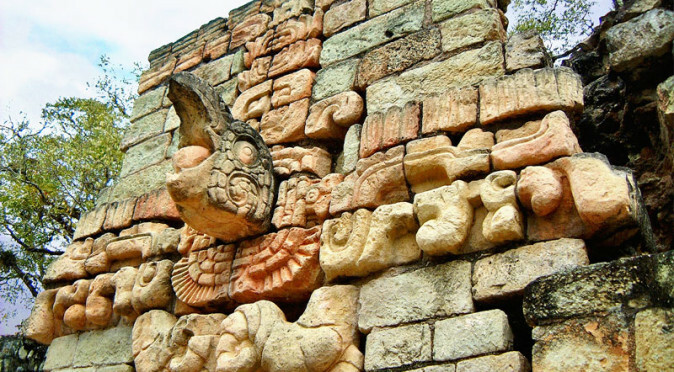 He constructed a temple over an existing temple that was built by Copan’s 2nd ruler in around 460AD. 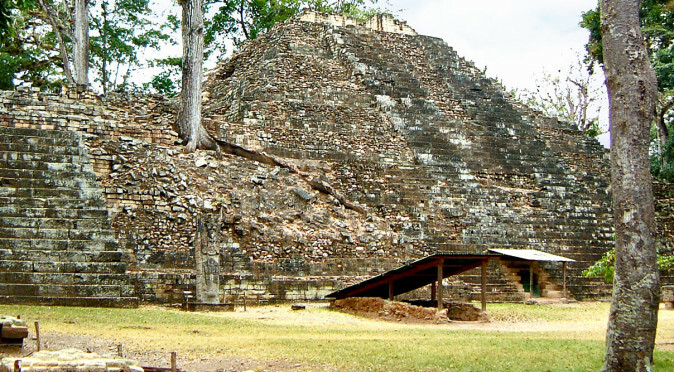 This temple had also been built over an earlier structure that was built by Copan’s dynastic founder, K’inich Yax K’uk’ Mo’ – and this was built over an even earlier structure that K’inich Yax K’uk’ Mo’ had built after founding the City of Copan in 426AD. In a re-enactment of K’inich Yax K’uk’ Mo’s initial double structure, 18-Rabbit also built a second Temple over his first Temple, having first buried his father, Ruler 12, within a tomb situated in the first of his Temples1. W1106Y: Incense Burner LidThe first clue to the Temple’s purpose was found buried with Ruler 12, Chan Imix K’awiil (known as “Smoke Imix God K” or “Smoke Jaguar”). Archaeologists uncovered 12 incense burners within the tomb whose lids were finely crafted to resemble the 12 dynastic rulers of Copan prior to the accession of 18-Rabbit. 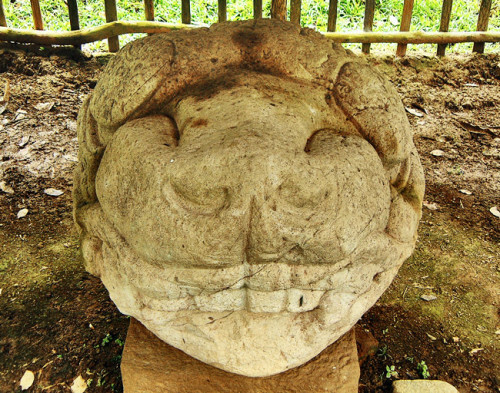 Whilst most are hard to identify, even with the aid of Altar Q, Copan’s founder is thankfully quite distinct (fig. 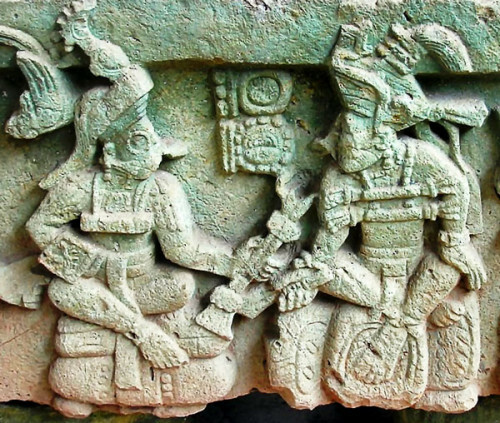 W1106Y), as he wears the goggles of Tlaloc to associate him with the elite of Teotihuacan, where it is thought he was crowned. 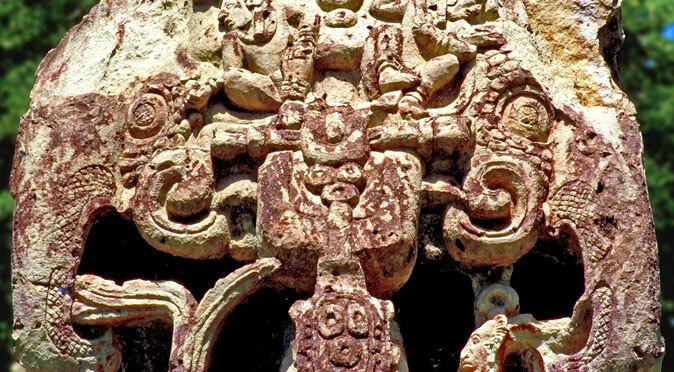 If he is represented on one of the lids, then it is fair to suggest that the other 11 lids are of the 11 other rulers of Copan. It seems likely that these 12 burners were used to invoke the spirits of the 12 previous rulers and give 18 Rabbit divine power or supernatural instructions. Therefore, the purpose of Temple 26 was most likely to provide 18-Rabbit with supernatural access to his divine ancestors. 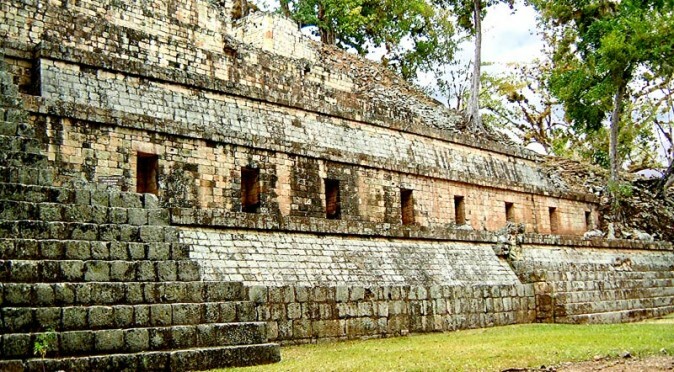 However, he buried this shrine, and access to it, within a huge Temple, which was more than twice as high as the burial temple and reached almost 20 metres above the Plaza. On this structure, 18 Rabbit installed the first rendition of the Hieroglyphic Stairway to relay his royal heritage. Within the text, 18-Rabbit affirms that K’inich Yax K’uk’ Mo’ was the first ruler and that he installed a vassal at Quirigua, known as Tok Casper, on the 9th September 426AD (this script is high up on step 62, as the stairs go back in time as you ascend them)2 – this information also appears on Zoomorph P at Quirigua. Back down on steps 7 and 6 there is some very interesting information, as the text repeats the name Tok Casper, only this time in relation to Smoke Imix’s mother’s heritage, suggesting that she was from the Quiriguan line. These steps also list Smoke Imix’s father, however they are too eroded to be read, but the glyphs begin with “Jaguar” and are too long to be the name of the previous Ruler, Butz’ Chan (Smoke Serpent). 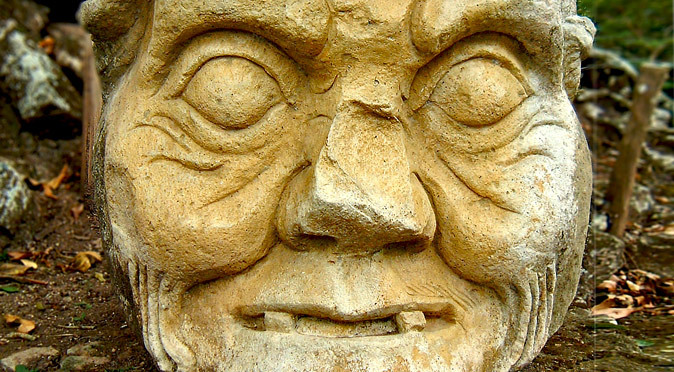 From the dates of monuments erected around Copan, we know that Ruler 11, Butz’ Chan, was born in 563AD and died in 628AD, making him 65 years old. Smoke Imix, came to power in 628AD and died in 695AD, a tenure of 67 years. Smoke Imix could have been no more than a teenager when he came to the throne to last such a long period in power, which means Butz’ Chan would need to have fathered him in his fifties or sixties – not impossible, but unlikely. 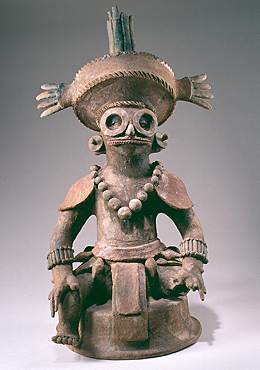 Therefore, there is a very high likelihood that not only was Smoke Imix half descended from the Quirigua lineage, but also that he was not a descendant of the Copan lineage. 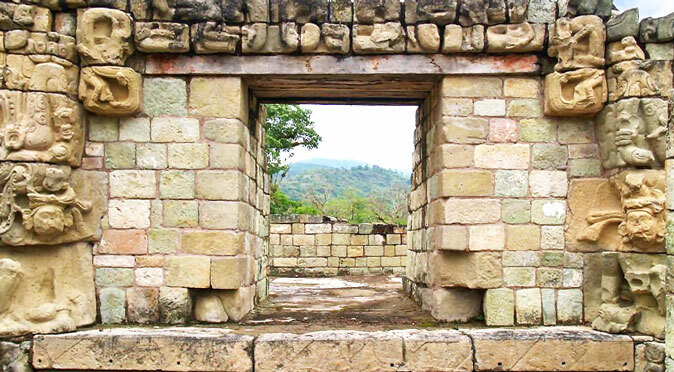 W1064QSF: Altar Q The same happens much later in Copan’s history, when Ruler 16, the son of a Palenque noble-woman, comes to power. 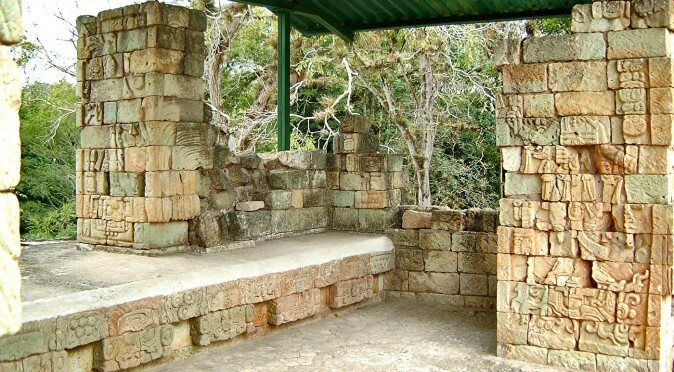 He built a series of monuments designed to provide him access to the underworld where he could receive the Royal Sceptre directly from the founder of Copan, Yax K’uk’ Mo’, – as shown on Altar Q (fig. W1064QSF). It seems that 18 Rabbit was also keen on building his way into the divine lineage, building Templo 22 as a portal to the underworld that backed onto the summit of Temple 26, and then building the hieroglyphic stairway upon Temple 26, detailing his divine royal lineage and allowing him to walk back in in time to meet with the ancestors who he had entombed with his father, deep within the temple in the form of 12 eternally burning censers. The idea that 18 Rabbit and his father were descended from the Quiriguan lineage is also supported by the 18 Rabbit’s eventual demise. Having installed a new vassal king at Quirigua in 724AD, 18 Rabbit was subsequently captured and beheaded 14 years later by his subordinate, Cauac Sky. 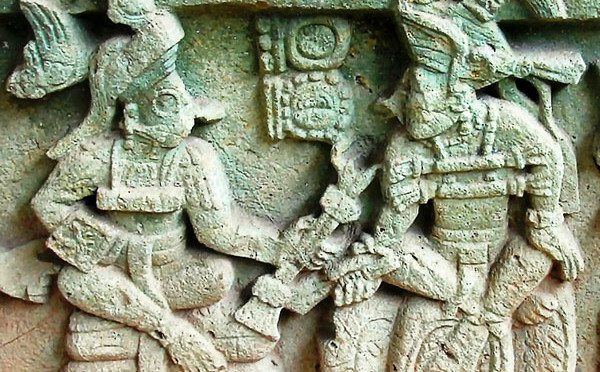 Now, no-one knows why this happened, but the absence of any obvious retaliation makes it appear that Copan were quite resigned to this fateful act. Quirigua then took control of the all important trade on the Motagua River, which left Copan struggling financially – and yet they still didn’t travel the 40km to Quirigua to exact revenge and retake power. 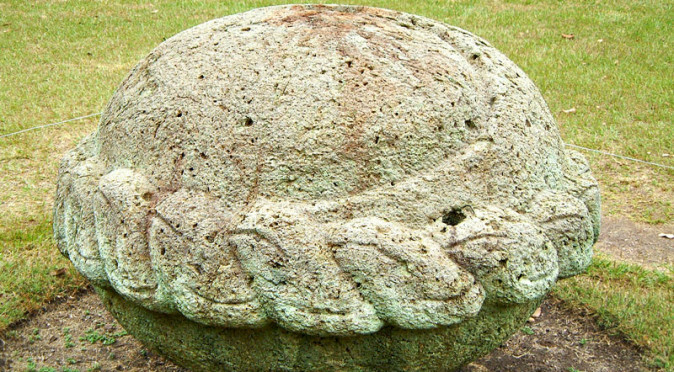 Of course, if 18 Rabbit was from the Quiriguan line, then he would have been equal to Cauac Sky, or Cauac Sky may have actually been from a more legitimate line than 18-Rabbit and have been offended by his installation as a subordinate, when he had every right to the throne at Copan. W0981: Altar M at Quirigua To support this theory, decipherment of Altar M at Quirigua suggests that Cauac Sky began to list himself as Holy Lord of Quirigua in 734AD. 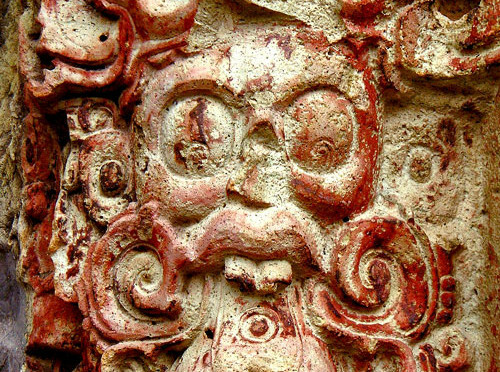 It is not known who Cauac Sky descended from though, but he and 18 Rabbit share a distinct likeness – they are both often pictured with Pharoanic beards (see the article on Stela B at Copan, and the unlikely article about the Pharoah of Quirigua). They may not be related, of course, and there is a chance that Cauac Sky was a descendent of Butz’ Chan, and that the lineage switched. There is also a possibility that the lineage of both Copan and Quirigua were always linked, and that Tok Casper was the brother of Yax K’uk’ Mo’.